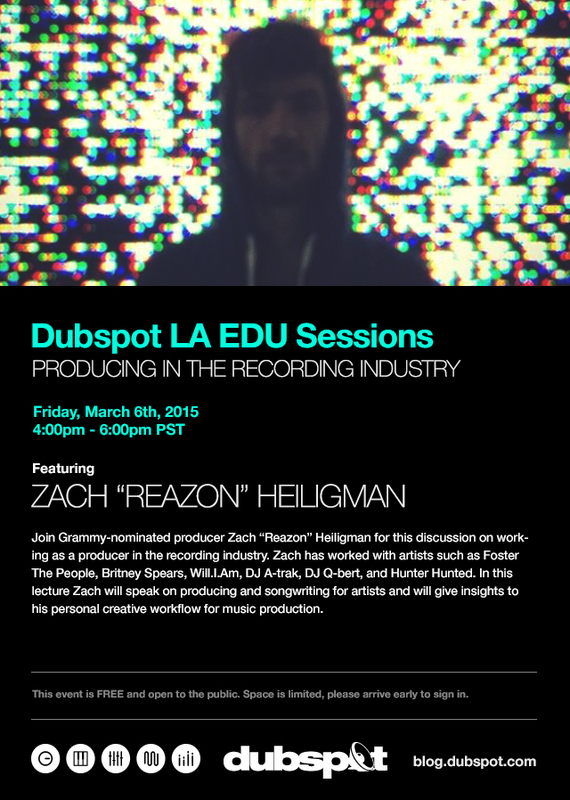 On Friday March 6th, Dubspot’s LA EDU Sessions continue with a free workshop on working as a producer in the recording industry with Grammy-nominated producer Zach “Reazon” Heiligman. Join Grammy-nominated producer Zach “Reazon” Heiligman for this discussion on working as a producer in the recording industry. Zach has worked with artists such as Foster The People, Britney Spears, Will.I.Am, DJ A-trak, DJ Q-bert, and Hunter Hunted. In this lecture Zach will speak on producing and songwriting for artists and will give insights to his personal creative workflow for music production. Since his move west, Reazon has found himself doing what he loves. With a fair number of accomplishments including his contribution as a Writer/Producer on the Grammy nominated album “Torches” by Foster The People. The album later went on to sell over 1 million albums in the US and was awarded a Platinum sales status by the RIAA. As a Producer/Songwriter, Reazon’s work has collectively charted three times in the top 10 on US Billboard Charts. Including the #1 spot on the Billboard Rock Chart and a Grammy nomination for best alternative album. Zach has production/co-writer credits with artists such as Britney Spears / Will.I.Am, Foster The People, DJ A-trak / DJ Q-bert, Hunter Hunted, and many more. As an original member of Foster The People, Zach co-wrote the song “Miss You” from their debut album Torches.